Why has it taken me so long to plant an orchid in my garden? 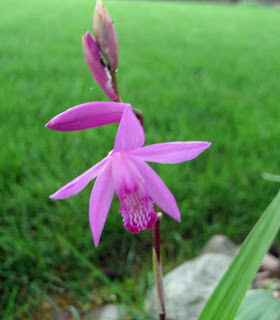 This spring, I found Bletilla striata, a hardy orchid, at one of the local garden centers. Tucked away in a corner in black one-gallon plastic containers, these orchids just looked like some lily leaves with a small flower stalk. But they drew my attention and I couldn't put one in my cart fast enough, even though I didn't know much about them, other than what was on the tag. "Hardy orchid with shiny green foliage and hot pink flowers in summer. Prefers dappled shade." That's enough info for me to buy an orchid! Indeed, it is an orchid! A very pretty little orchid. And since most people think of orchids as growing in the jungles and Florida and other warm places, it will be a nice surprise to see it growing outside in Indiana, just like it is a surprise to see prickly pear cactus blooming in my garden. I was surprised by another unexpected flower in my garden this morning. It's unexpected because I have no idea what it is, if I planted it, if it is a weed, or if the garden fairies planted it, or just how it came to be in my front garden, of all places. You would think with my constant posting and harping about keeping a garden journal or some kind of record of what gets planted in your garden, I wouldn't find my self staring down at a flower in my own garden thinking, "Who or what are you?" The foliage on this plant is odd, too. It's sort of blue green and straplike. I think this made an appearance last year, but at some point I must have cut it off. Perhaps it is a bulb I planted and forgot about? I just know I have no recollection of it. If anyone could help identify this plant, be it a weed or a cultivated flower, I'd be forever grateful. 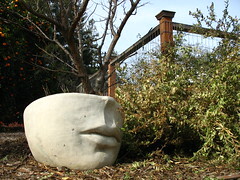 What's unexpected in your garden? I can't believe you have a flower blooming that you can't name, Carol:) I do hope someone can identify this; it's certainly a striking blossom with interesting foliage. I'll be interested in knowing if it stays upright like this after storms and winds. Carol, DIPT strikes again! It is a lovely flower though. The orchid is beautiful and should cause quite a few comments. Hope it is hardy to your area. We will all be wanting to know. The first time I want to Bog Pond (near Savoy campground in western Massachusetts), I was so surprised to see beautiful orchids (Rose Pagonia). They bloom on the bogs in the middle of the pond on floating sphagnum moss mats. Just beautiful. Another fun treat were the pitcher plants and a good lesson in biology for the kids, who at the time were elementary aged. There is something familiar about the foliage and flower....but other than that, I got nothing! The Orchid is lovely...another plant to the list! We all understand about the journal, it happens. You could try my plant tag in the cup system! 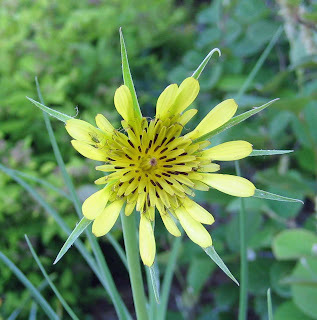 The yellow flower sure looks like Tragopogon dubius. It confusingly has the common name of goat's beard but has nothing to do with Aruncus, also common name of goat's beard. 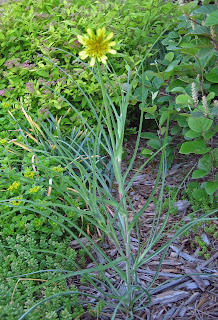 Tragopogon porrifolius is salsify, grown as a vegetable for its roots. Rose... believe it, I do have some plants in my garden that I don't know the name of! This one withstood some pretty strong winds Friday night. Beckie... The orchid is supposed to be hardy to zone 5, which is what I am. Read further comments, I don't think the yellow flower is a case of DIPT. Daphne... Those orchids do sound pretty. Gail... I saw your tags in a cup system. I'm looking to do something maybe a tad bit more organized to keep track of my plants. Judy... I think you are right, after looking at some of the pictures around the web. So it IS a weed and I didn't forget about a plant I planted. I think I'll go and pull it before it sets seed. Thank you! That's yellow salsify. While you can eat the long taproot, it's not esp. tasty and if you let it go to seed you will have it EVERYWHERE. My strong advice: Consider it a noxious weed. Orchids are among the most widespread plant families, growing on every continent. Tho' I find it hard to imagine them on Antarctica. Oops, our comments crossed. :) We're both reading your blog right now. Chuck... That's exactly what I'm going to do... pull that weed. Consider it done. And yes, orchids are the most widespread plant family which is why I wanted some in my garden, not just in my sunroom. 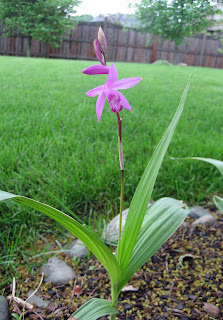 That orchid is very pretty, but it is strange to see it growing in the ground in an Indiana garden. I didn't know there were such orchids. I think you will love the hardy orchid. A friend brought me a piece from New Orleans over ten years ago and it has multiplied and blooms every year. He has since passed so that plant always reminds me of him. Unbelievably, I bought and planted that same orchid in my yard this year. I know it as Chinese ground orchid; it was growing well at Zilker Botanical Garden in the shade so I bought a few, very expensive ones. They should spread easily. I'm no help on your other flowers. Valerie... Good luck getting rid of those pretty weeds! Pam/Digging... I knew there were orchids hardy in Indiana, but this is first time I've seen some for sale at a garden center. I was excited to find them. Phillip, I hope mine make a nice clump, too. We shall see. Vertie, Surprisingly, these orchids were priced no higher than most of the other perennials.